I'm officially over this winter even though it has been rather mild and sunny in comparison to previous years. I don't want to see my parka or heavy coats for another year. My legs are so pale that they glow in the dark. I have trouble handing over wads of cash for denim cutoffs. They're essentially worn jeans or factory distressed; ripped, stretched and then snipped off. As I looked at the hordes of cutoffs available at online stores, it brought back memories of my early backpacking days when I stole my then skinny teenage brother's Levi's 501s and wore them till spring turned into summer. When I could no longer bear the heat, I borrowed a pair of scissors from the pension owner and made my own shorts. It didn't even cost me a cent. 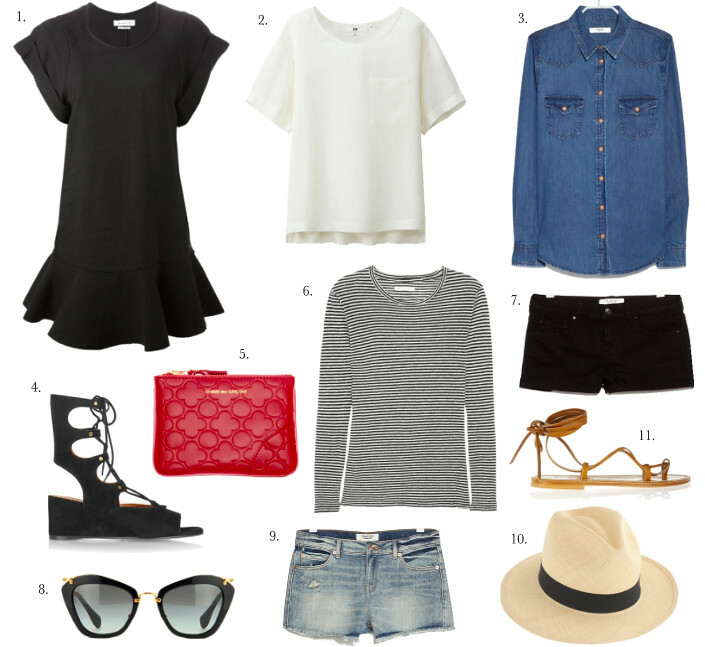 When the weather's hot, I want my outfits to be airy, light and loose. Anything tight makes me feel like my innards are being squeezed. Since our summer days tend to be short and unpredictable, I rarely go crazy and shop up a storm. I've been mulling over my summer pieces and pretty much decided that anything I buy this year has to pull double duty. Well, other than the cut offs. What's on your summer shopping list? Do tell. I thought those K Jacques sandals were the Isabel Marant Amys, I am so glad they are $200 less! Great finds, thanks! I've worn K Jacques sandals for years. It's rather shameful to say but I really do abuse them. They've been in salt water, muddy paths etc and they still last and last. I'd rather buy them than IM Amys. I haven't bought any summer clothes for a long time. When I did, I had quite a few linen items from German company Oska. I find linen items to be very cool. I also like trousers with some (or a lot) of stretch in them. I've heard about Oska. I didn't realize they're German. I'll go and google them to see if they have an online store. Had a look online and could see they have a few stores in London now, including one in Duke of York's Square. When I bought their items, it was from various small boutiques, and Selfridges. Their drawstring linen trousers were extremely comfortable. How did I miss it? I've walked past Duke of York's Square numerous times. I'll be sure to take another look when I'm in London. Thanks, Helen! You've reminded me to search for my peasant tops. They're somewhere in my closet.....I think. I used to be obsessed with Saint James and Petit Bateau breton tops but the jersey material is just way too thick to wear under most jackets especially in summer. Many thanks for reading. Really appreciate your support! Have you managed to hunt down that elusive wallet yet? You've got me hankering after one now! Hah! No. I even searched Mr Porter and they've sold out of red. Pfffft. Laura, you need to get yourself a pair of K.Jacques. They're very well priced especially during the sales season. I have 2 pairs of strappy K Jacques sandals and they wear remarkably well. Great selection, Marlene! I have a very small (with a growing potential though..) wish list (as I'm planning to recycle what I've already got and love) consisting of: same silk Uniqlo t-shirt/top as you featured (in grey for me), linen Massimo Dutti blazer, leather Hush espadrilles & classic Ray Bans (aviators). Oh and I've just bought two cotton boxy t-shirts (black and grey) from &the other stories that I know I'll live in come summer. Thanks, Irina! I haven't thought about Coccinelle in years. Thank you for the reminder. The quality of clothes at & Other Stories is pretty impressive if you consider the price. I wear my panama hat a lot. I tend to go for ones with a wider brim because they offer better sun protection. Mel, thank you ever so much for the kind words! Much appreciated. I finally found white jeans that don't make me hate myself. Please tell me where you bought them from. I'm not tall and thin. Every pair of white jeans I've tried on in the past made me look like I've got tree trunks for legs. AG The Stilt Jean. But size up one size. That's the key! 7 For All Mankind Kimmie straight leg. I bought my normal size. Hi Marlene, I am finally back again in the blogosphere. I hope you are doing well. Love this post. I am also so over Winter and ready for everything associated with Spring. Love your selection of stuff and I have been eyeing a pair of K. Jacques sandals. After seeing them on your blog... I might just need to pull the trigger. ;) Have a great weekend!